British Columbia, Alberta and Saskatchewan Motorcycle Ride, 2008. September 7: Left Revelstoke and rode to Canmore, Alberta spending the night there. Special thanks goes to The Canadian Rockies Chalets in Canmore, Alberta for providing accommodations. September 8-10: Left Canmore at 11:00 am with a temperature of 3 degrees riding to Kananaskis Country where I spent three days filming this incredible area. 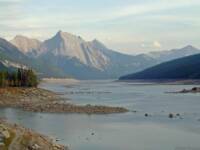 Some of the areas featured: Barrier Dam, Peter Lougheed Provincial Park, Highwood Pass and the Kananaskis Village with five outstanding viewpoints on the Delta Lodge's property. September 15: Left Weyburn and rode back to Medicine Hat, home of the world's largest tepee. 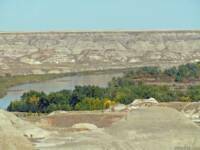 September 16-17: Medicine Hat to Drumheller. Some of the areas featured: Royal Tyrrell Museum, Dinosaur Provincial Park, the Hoodoos and the back 9 of the Dinosaur Trail Golf & Country Club. September 18-22: I left Drumheller at 8:30 am and rode to Jasper. I spent five days filming in Jasper National Park and Banff National Park. Some of the areas featured: Medicine Lake, Maligine Lake, the Columbia Icefield, Highway 93 the Icefield Parkway and a heli-tour courtesy of Icefield Helicopter Tours. Special thanks goes to the Mount Robson Inn for providing accommodations while filming in the area. We appreciate your contributions to Virtual Riding Television. September 11: Left the Kananaskis Village and rode to Medicine Hat, Alberta, spending the night there. Special thanks goes to the Motel 6 for providing accommodations.